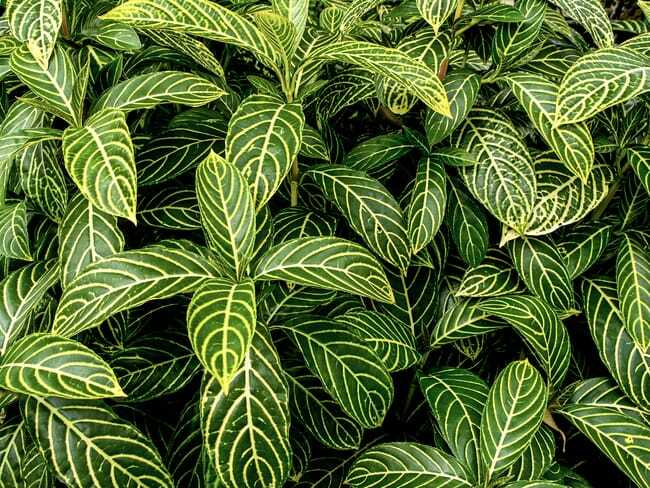 The Zebra plant, otherwise known as Aphelandra squarrosa, is an evergreen shrub, which makes an attractive houseplant due to its evergreen foliage and striking variegated appearance. It is natively found in the rainforests of central and South America, where it thrives in the wet and humid conditions. Some of its recognizable features include dark emerald-green leaves, white markings along the veins, and a crown of dense saffron-yellow flower bracts. These flower bracts have given this plant the alternative name of Saffron Spike, and its many unique features make it a perfect ornamental plant to display in your home. Whilst a fairly temperamental house plant, with a tendency to drop its leaves when not treated correctly, I believe that proper zebra plant care instructions can avoid any major issues, and the effort is more than worth it. This article will tell you exactly what to do to keep your zebra plant thriving and looking great. 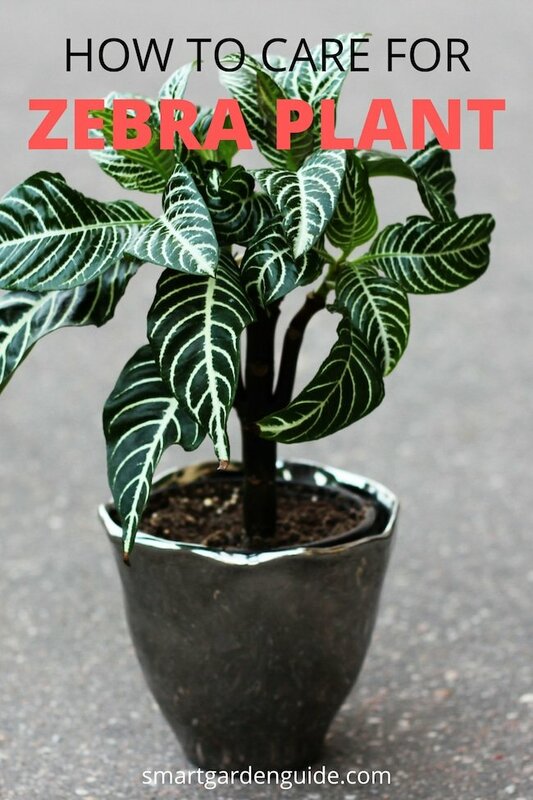 What Size Are Zebra Plants (Aphelandra Squarrosa)? Zebra plants can grow to be 6 feet tall and 5 feet wide in their natural environment, but when grown indoors, this species typically only reaches a height of 1 to 2 feet. The individual leaves are oval in shape and can grow to be 9 inches in length and 2 inches in width, while the saffron-yellow flower bract can grow to 8 inches tall and 2-3 inches wide. The time it takes for the Zebra plant to reach its maximum size varies greatly depending on the conditions that it is exposed to. Good Zebra plant care requires bright light and they should be placed in a well-lit area that receives indirect or filtered light. Never expose a Zebra plant to direct sunlight and always protect the plant from the hot afternoon sun because too much direct sun will result in scorching of the leaves. Bright light is preferable in the spring and summer months while moderate light is better in the fall and winter months. The Zebra plant can be quite temperamental and requires more attention to watering than most plants. Aphelandra squarrosa won’t tolerate excessively wet or dry soil, so you will need to ensure that your watering keeps the soil, moist but not excessively wet. A little water on a frequent basis is definitely the best option for the zebra plant. If the soil dries out, the leaves of the plant will droop down very quickly. Left without water for any prolonged amount of time, and the leave will start to drop. If you do see the leaves of your zebra plant drooping, ensure to water it straight away, or try to identify any other cause of stress to the plant. Once it receives water again, it will bounce right back up, given that it hasn’t gone too long without water. Due to its temperamental nature, I would recommend using lukewarm water to water aphelandra squarrosa. The water should also ideally be soft water, so it you live in a hard water area, you may wish to think about using rainwater to water your zebra plant, which will have a lower level of dissolved minerals. Anything to minimize stress to the zebra plant will improve your success in growing this plant. What Soil Does A Zebra Plant Need? Zebra plants thrive in a well draining, rich potting soil and with a good amount of peat moss. Zebra plants grow best in soil which has high organic matter content, but which drains well. In practice, a good strategy is to mix 50-60% peat, with equal parts potting soil and perlite or coarse sand. Another strategy to increase drainage is to add some stones to the bottom of the potting container, as this will help water drain away from the soil and out of the pot. What Fertilizer Should I Use For Zebra Plants? A well balanced, water soluble fertilizer should be used every two to four weeks during the warmer months of the year and no fertilizer should be used during the cooler months. In order for this plant to thrive, it must be placed in a humid environment, with ideal humidity levels of greater than 60%. Since Zebra plants originally come from the Atlantic Forests of South America, it is important to mimic those conditions as closely as possible. Most home environments will naturally have lower humidity levels than this, so it is generally a good idea to manually increase the humidity levels around the plant. This above-average humidity can be achieved by placing a small humidifier nearby the plant, setting the pot on a wide based drip tray partly filled with water, misting the plant frequently or by placing the plant with other house plants, which will increase local humidity levels. What Temperature Is Best For A Zebra Plant? Just as Zebra plants thrive in humid environments, they also thrive in warmer temperatures. During the plant’s period of active growth, a temperature of 65-75 °F is ideal. During the plant’s period of winter rest, cooler temperature are preferred but should still not dip below 50 °F. In general, it is important to make sure that the zebra plant is not exposed to temperatures below 60 °F for a prolonged period of time, as this is likely to cause leaf dropping due to the excessive stress placed on the plant. 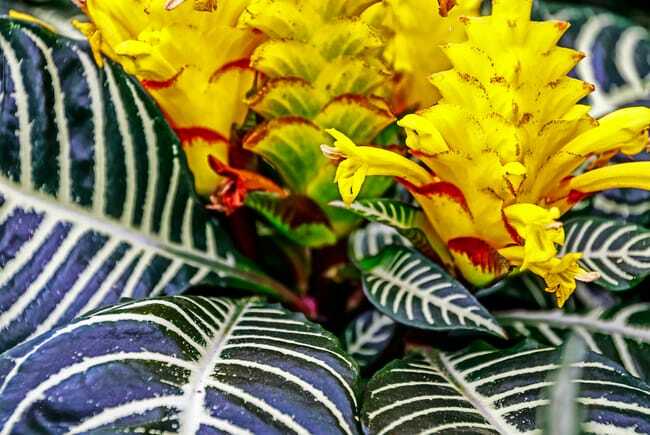 The flower of the Zebra plant, a magnificent yellow bloom, is one of its most distinguishable features and is said to look like a bromeliad or a pineapple. The flowers typically come in the late summer and throughout the fall. While the flowers themselves will only last for a number of days, the bracts will remain intact for approximately 6 weeks. After that time, it is important to cut off the the saffron-yellow crown immediately and prepare the plant for a second bloom. While another bloom is never guaranteed, this will at least give the plant a reasonable chance of producing a second beautiful flower. As time goes on, the Zebra plant can become leggy and stalky and will therefore require pruning to trim off the dead leaves and remove die back. If and when the Zebra plant is flowering, remove flowers as they die and prune the stems and leaves as soon as the bract starts to die. The reason for doing so is to encourage a bushier plant for potential future flowerings and to prevent the plant from stretching out as much as possible. During the springtime, it is possible to propagate Zebra plants from both tip cuttings and stem cuttings. To do this, cut off 2 to 3 inches from the tip or the side shoots and plant the respective cuttings in a separate mixture that is suitable for mature plants of this species. Add plenty of moisture to the soil and place it in a humid area that receives bright filtered light and has a temperature of about 75 °F. Within 6 to 8 weeks, there should be new growth and sometimes the cuttings will actually do better than the original plant. Zebra plants make great indoor plants, as well as patio and porch plants, and are ideal for pots and containers. Since this plant grows upright, it is best to plant them in pots that are taller than they are wide. That said, Zebra plants can also be extremely difficult to raise and therefore require special care. Tips for planting include rotating the pot frequently to ensure that the plant doesn’t begin to lean into the light as it grows, misting the plant often to increase the humidity, and pinching out the tips of the plant to make it less leggy and more bushy. Each year, typically during the springtime, Zebra plants should be repotted in a fresh mixture of potting soil to initiate a new wave of flowering. Avoid a pot that gives the zebra plant too much space, as they do best when the roots are kept fairly compact. If your zebra plant has been particularly crowded, opt for a pot only a little bigger. When re-potting the Zebra plant, remove the old potting mixture from the roots of the plant as much as possible, being careful not to harm the plant’s roots in the process. Depending on the size of plant that you are trying to cultivate, it is often a good strategy to prune a zebra plant back to a single pair of healthy leaves before repotting. 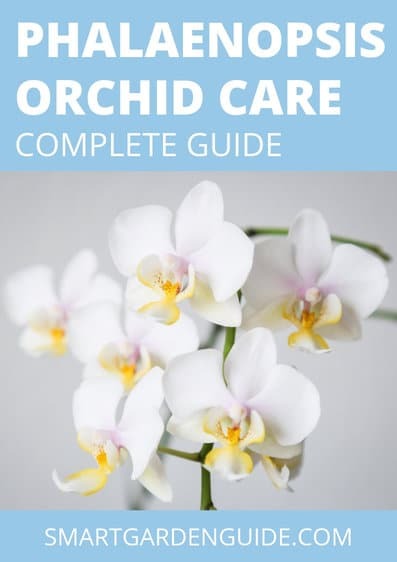 This tends to stimulate new growth, keeps the plant more compact and shapely, and often results in several main shoots growing, which will result in increased numbers of attractive flowers later in the year. There are several varieties of the Aphelandra squarrosa. Both the Aphelandra squarrosa Louisae and the Aphelandra squarrosa Brockfeld are more compact versions of the primary species. 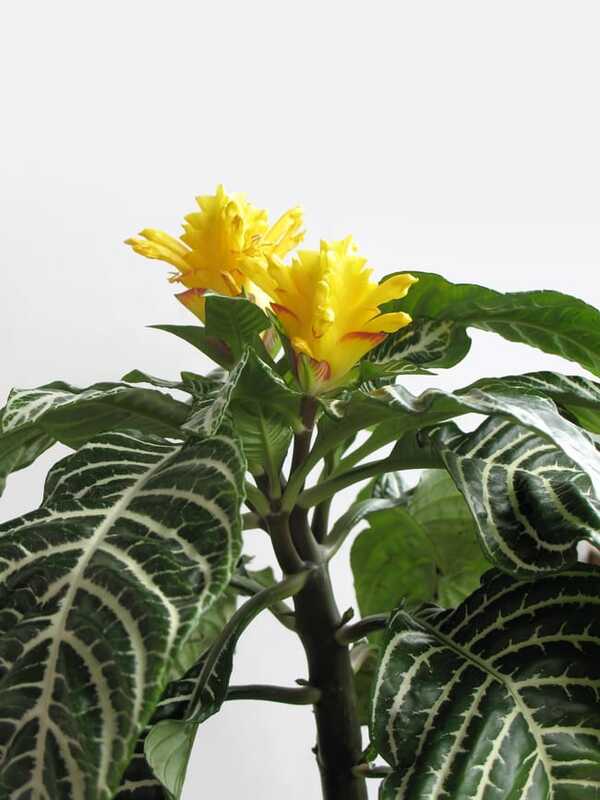 The Aphelandra squarrosa Dania has leaves that are slightly silver in color and it is also known to be the most difficult variety to make bloom. The Aphelandra squarrosa Frintz Prinsler is known for having a striking appearance which is attributable to its beautiful leaf-veining and extremely sharp contrast of colors. Finally, the Aphelandra squarrosa Apollo boasts a dramatic white venation while the Aphelandra squarrosa Red Apollo offers a hint of red in its stem and the undersides of its leaves. What Diseases And Pests Is The Zebra Plant Prone To? Zebra plants are not immune to diseases or pests and should such problems arise, this species requires proper attention and care to fend off potential issues. Even though the high humidity that Zebra plants love so much keeps many pests away, it can also bring on a variety of fungal problems. Too much light can cause crinkly and curly leaves while too dry soil can cause growing tips to wilt. As for pests, whitefly infestation is a common problem with Zebra plants, resulting in little yellow spots on the leaves of the plants. Another infestation problem is with fungus gnats, which make the Zebra plant weak and slows its growth drastically. Mealybugs, or plant-sucking pests, are another problem which results in white clusters on the stems of the Zebra plant. Similarly, aphids are sap-sucking insects which feed on the undersides of old and new leaves. To rid a Zebra plant of such pests, use a cotton swab that has been soaked in rubbing alcohol to wipe the creatures off, then spray the leaves with water and treat them with a systemic insecticide. The Zebra plant is safe for households with small children and it is not toxic to cats, dogs, or other animals. While the plant is not said to be poisonous to these creatures, people with allergies or sensitive skin have reported slight skin irritation from the sap produced by Zebra plants. Therefore, it is a good idea to wear gloves when handling the plant or trimming off its dead leaves. How can I save my dying Zebra plant? Due to the temperamental nature of these plants and the care that is required for them to thrive, it is not uncommon for Zebra plants to start looking unwell. The most likely culprits are lack of light or too much direct light, too much or not enough moisture, or too little humidity. Pests should also be considered, so be sure to examine your plant carefully. The best way to save a dying zebra plant is to avoid this situation in the first place. For anyone getting a zebra plant, my advice would be to be very attentive for the first 4-6 weeks, responding quickly to any signs of stress or poor plant health. In this way, you will very quickly learn how to keep your plant happy, and this will allow you to keep the plant in good health for a long time. Why can’t I bring my Zebra plant into bloom? Zebra plants are not the easiest plants to get to bloom and they actually don’t bloom very often. That said, you can encourage blooming by increasing the amount of light that the plant receives throughout the day, ensuring that the proper temperature and humidity conditions are met, and removing any dead flowers from the current crown. How long will my Zebra plant live? Zebra plants are said to be perennial, meaning that they can live for many years, however, these plants require a great deal of love and care to live such a long and healthy life. With propagation, Zebra plants can hypothetically live forever.